Oddly there's no speaker volume icon in my KDE Plasma 5 system tray and I can't seem to find it in the options for the system tray. Here (http://i.imgur.com/NVKojWK.png) is a screenshot showing both my system tray and the system tray settings window. I saw this forum post about the same problem but with an older version of KDE Plasma. As a result of which I checked that kmix was installed, which it was. I also reinstalled kmix with the pulseaudio USE flag enabled (as by default it wasn't, only ALSA support was enabled), but it made no difference. Have you started kmix yet? I assumed it started on startup. Just ran kmix and the issue is fixed! Sorry for wasting ya time, didn't realize it was this simple. 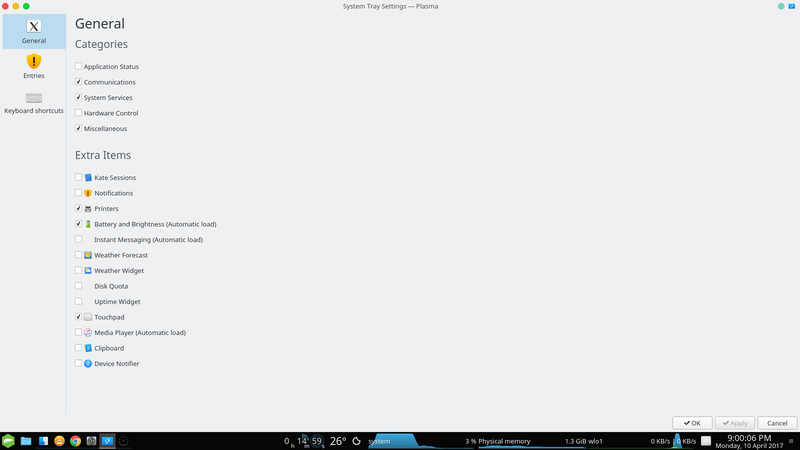 On most distros kmix starts on KDE startup. ...after you started it, it starts. But kmix is not a part of Plasma at all. On other distros, they may use plasma-pa, which you can also have of course. It is installed by plasma-meta if you have pulseaudio selected.